In the changing city landscape one of the most important demands to be met is the increasing desire of families to keep living in the city. Previously whenever they had children families would move out to the suburbs, but the city is becoming more and more attractive. It is the place where things happen and where all your friends live. However the city may not necessarily provide for the changing needs of families. The most common typology for families is the terraced house. This typology has qualities such as providing storage space and a garden. There are several reasons though why it is not efficient anymore to keep building terraced houses. These take up a lot of space and therefore don’t contribute to the densification of cities. It is also expensive to build them, so terraced housing would only be accessible to higher income groups. 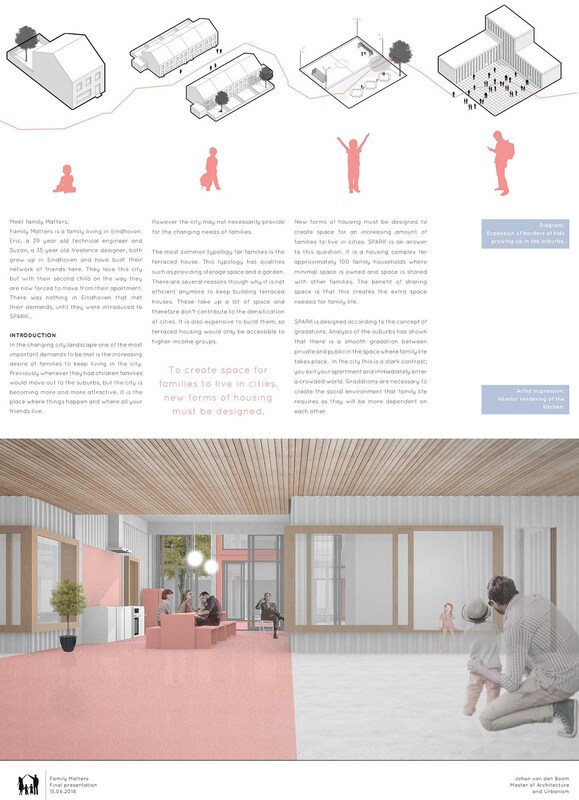 New forms of housing must be designed to create space for an increasing amount of families to live in cities. SPARK is an answer to this question. It is a housing complex for approximately 100 family households where minimal space is owned and space is shared with other families. The benefit of sharing space is that this creates the extra space needed for family life. SPARK is designed according to the concept of gradations. Analysis of the suburbs has shown that there is a smooth gradation between private and public in the space where family life takes place. In the city this is a stark contrast; you exit your apartment and immediately enter a crowded world. Gradations are necessary to create the social environment that family life requires as they will be more dependent on each other. Parents should be able to enjoy the benefits of helping each other out and children have the need to interact and play. Families are a good target group as it’s required that there’s catered for a healthy social environment which will enrich city life. A typical housing unit in SPARK is 80m2 and consists of only the basic functions; a bathroom, toilet, pantry, storage room and two small bedrooms. These are primary functions. All secondary functions such as a living room and a kitchen are shared with other residents. A study of the reference project: ‘Mehr als Wohnen’ by Duplex Architects in Zurich, has proven that it is possible to live this way. In ‘Mehr als Wohnen’, a typical apartment is 45 m2 and four apartments share one living room and one kitchen. Interviews with 15 different families showed that these families all have a similar routine in common when it comes to time management. Due to the schedule of their children and their own work, they are more attached to a ‘9 to 5’ mentality, meaning that during the day lots of space inside SPARK is vacant. Therefore these spaces can have double functions. A kitchen can be a place to work during the day or a children’s playroom can be a living room for parents at night. These interviews also revealed the desire for very large hallways. It’s a great space for children to play indoors and can also be used as a storage room for the families. The benefit of sharing a living space with other families is that you can also share/reuse all sorts of stuff such as books, baby clothes or toys. SPARK is located on the old VDMA terrain in Eindhoven. The existing ensemble consists of three buildings: the ‘VDMA-garage’, the ‘Lucifer fabriek’ and the ‘Zusterflat’. The additional value of this ensemble is that the compositions of the three buildings form an inner world which offers a safe family environment. The ‘Sargfabrik’ in Vienna by BKK-3 Architecture is a reference project of similar size also designed as an inner world inside a city block, housing approximately 300 families. The face of the ensemble is the ‘Zusterflat’. This building was built in 1958 after the original building was destroyed during war. At the time the building was built to house nurses and also contained a car showroom in the plinth which was owned by ‘van der Meulen-Ansems’, just like the rest of the ensemble. The building stands on two legs, forming a gate to the complex. The ‘Zusterflat’ together with the ‘Lucifer fabriek’ and ‘VDMA-garage’ are situated around an inner courtyard. The ‘Luciferfabriek’ built in 1890 was transformed by ‘van der Meulen-Ansems’ in 1921 into an assembly line for the production of cars. Its monumental quality lies in the shell that is wrapped around an iron construction giving the building its spatial quality and can easily be used as a half-climate. The VDMA-garage was built in 1929. This build does not have a lot of potential for transformation. It’s a flat box taking up a lot of space and as a result hinders densification of the area. Therefore the decision was made to demolish the VDMA-garage and build a new building. This new building is designed as a 3-dimensional grid that connects to the ‘Lucifer fabriek’ and the ‘Zusterflat’ by an interior route. This way the ensemble is not three separate buildings but one building housing several neighbourhoods. The benefit of living in SPARK is to have access to all sorts of extra facilities. As stated before, the residents will share the kitchen and living room. The complex also facilitates a restaurant, a kindergarten, a design and technology lab and joker dwellings. The restaurant is ‘one menu for all’. The busy schedules of parents often make it impossible to cook a decent meal. In the restaurant you can eat a decent meal for a good price. The restaurant also allows diners from outside of SPARK stimulating a balanced interaction between people. The kindergarten makes the lives of Spark’s residents much easier. It’s a place where they can drop off their children before work without having to all across town. Children love it because they can play with the children from in- and outside the complex. There is a design and technology lab in the SPARK complex. Design and technology are the primary functions that put Eindhoven on the map. Through collaboration with the Technical University and the Design Academy Eindhoven, programs can be run reflecting the innovating city that Eindhoven is. Think of expeditions, technological experiments, interactive workshops to create a live and learn environment for residents and the city. SPARK is an addition to Eindhoven. It adds value on several different levels. On a social level it adds value by creating housing for a target group that struggles to find living space in cities. The addition of this target group means functions are also added to the city. 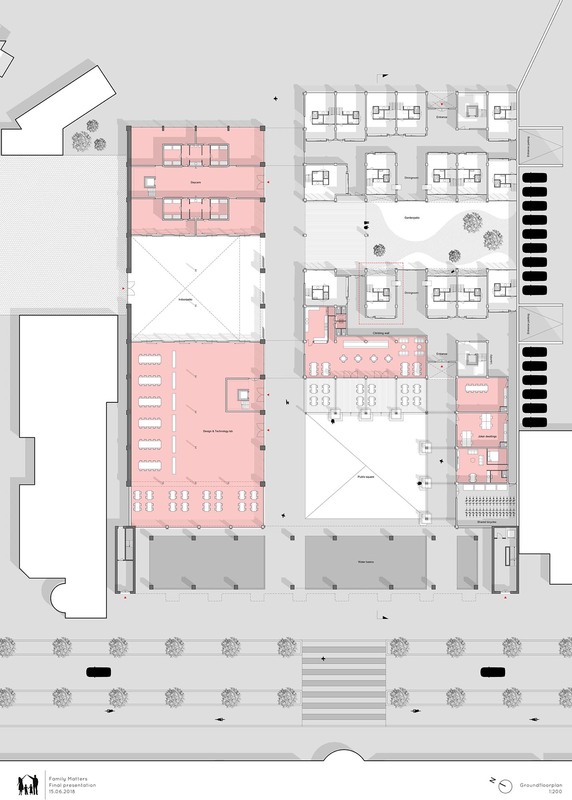 In this case a kindergarten, a restaurant, a design and technology lab and a number of city squares. 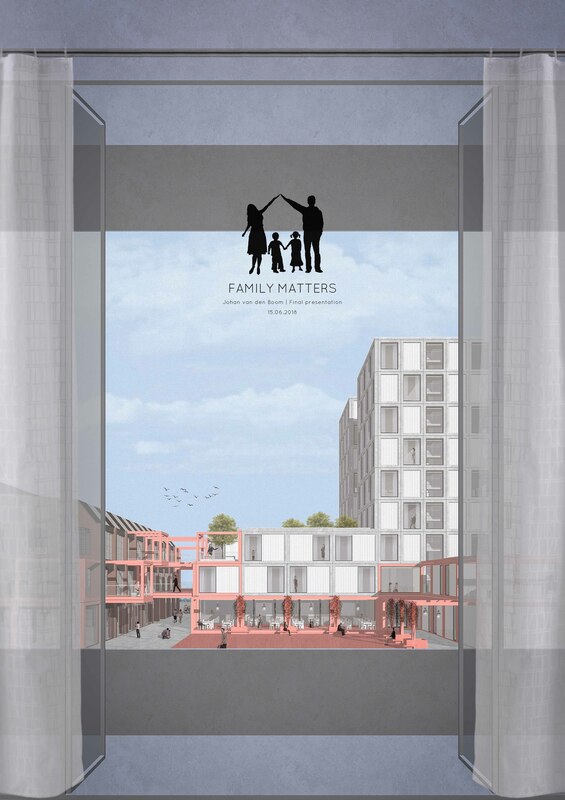 Plus, families as a target group can contribute to a healthy social and ecological environment in the city. They take extra care of their direct environment considering they have children to bring up. The children are also little connecters amongst people as children do not differentiate on ground of culture or background. On spatial level SPARK breaks the hard boundary between city centre and the neighbourhood. SPARK functions as a soft gradation between city life and a world made for housing. Because SPARK is designed as an intra-world in the city, it can easily be encapsulated when Eindhoven expands and still function perfectly. And finally, on the level of sustainability SPARK adds water square to the city. It has become evident that rainfall is increasing on an almost monthly basis and that cities are having a hard time dealing with all this excess water. The basement of the ‘Zusterflat’ is used to store giant water tanks that collect rainwater. This water can be used for flushing toilets and will save 50% of washing machines’ water usage. The water square makes the dynamic of water visible; it both adds to the level of experience and stimulates awareness.